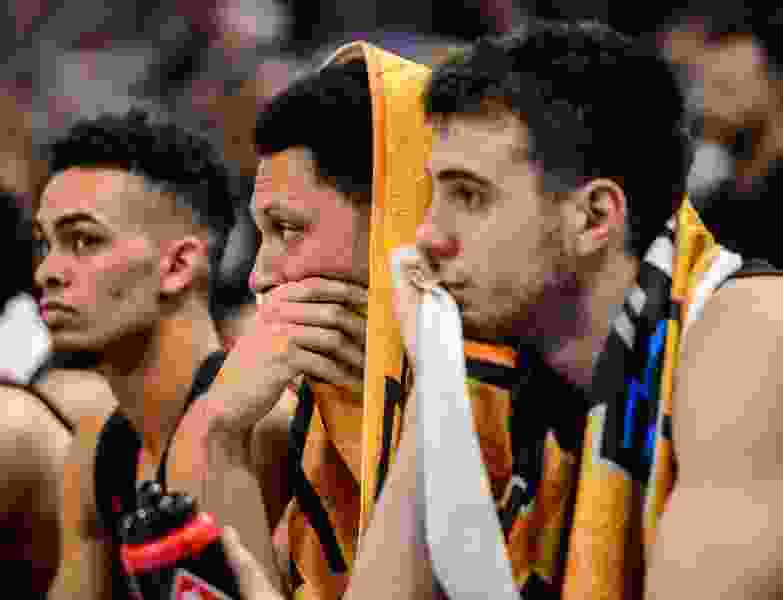 (Trent Nelson | The Salt Lake Tribune) Northeastern Huskies guard Myles Franklin (13), Northeastern Huskies forward Jeremy Miller (11), and Northeastern Huskies guard Vasa Pusica (4) on the bench as Kansas holds a double-digit lead over Northeastern in the 2019 NCAA Tournament in Salt Lake City on Thursday March 21, 2019. And so, the Cinderella stories end in Salt Lake City. Not this year, not at Vivint Arena, and mostly not in these first couple of rounds of the NCAA Tournament, though No. 13 seed UC Irvine laid claim to a piece of the action Friday with a win over fourth-seeded Kansas State. Here, though, the ugly stepsisters win and the would-be sweethearts of the ball go back home to clean the house. Here the bullies survive, if that’s the word, facing off on Saturday in the second round — more on that in a minute — and surprise is sent packing, hoping for a better day sometime, someplace else. Here No. 1-seeded Gonzaga treats No. 16 Fairleigh Dickinson like it has no business being invited, winning so convincingly that nobody has enough elasticity in their imagination to stretch even in the direction of an FD victory. That’s what happens when the favorites win by 38 points, the largest margin in an NCAA Tournament victory in Gonzaga’s basketball-playing history. No and no. Now, get the floor mopped. “All we wanted to do was let everyone know we weren’t going to quit,” Fairleigh’s Mike Holloway Jr. said. The intensity is dialed up during March Madness. So what happens when coaches lose their voice during the most important time of year? Hah. Of all the humiliations. “There were a lot mismatches out there,” said Kansas guard Quentin Grimes. Basically, there was no opportunity. Here the closest things to a shocking upset are a No. 9 seed, Baylor, defeating a No. 8, Syracuse, and No. 12 New Mexico State almost — almost — beating fifth-seeded Auburn. Anybody remember in their storybooks hearing about the heroine almost defeating the bad guy, almost getting the prince? The Bears rained a bunch of 3-pointers on the Orange, up and over its zone defense, and won by nine. And the Aggies — oh, the Aggies — had their chances to get the glass slipper on, but they simply could not pull it past their big toe. After trailing by 13 points, they charged back at the end against Auburn, arriving within one a couple of times, neither of which resulted in success. New Mexico State could have altered the theme here, trailing by two points with just more than a tick remaining on the clock, if Terrell Brown had made his free throws, after being fouled on a shot from beyond the arc. Instead, he missed two of them, including the last one, which bounced off a Tigers player and out of bounds. That left one last shot, a 3-pointer from the left corner by Trevelin Queen — a perfect name for a fairytale ending — that veered right, into open air. And just like that, Cinderella took a forearm shiver to the throat and the last chapter ended without any real oomph or pizzaz, other than a kind of empty good job, good effort. What all that leaves is Saturday’s second round, featuring Kansas-Auburn and Gonzaga-Baylor. Not exactly the shocking material, the bracket-busting matchups of which NCAA Tournament lore is made. It will have to do. On the plus side, sometimes when underdogs win early games, they get smoked in later ones, failing to maintain their charmed circumstances, leading to blowouts. Here the blowouts already happened and Saturday’s games should be at least competitive. Auburn, an exceptionally athletic outfit that sometimes detaches its collective head from its collective body on the court, romped to the SEC tournament championship, routing highly-seeded Tennessee by 20 points. If the Tigers play smart against Kansas, they’ll give themselves a chance to win. Gonzaga ricocheted off a hard floor after an inexplicable loss to Saint Mary’s in the WCC title game to take the top seed in the West and dust Fairleigh Dickinson. Now, we’ll discover whether Baylor can continue to hit bombs against the Bulldogs, the way they did — 16 of 34 — against Syracuse’s zone. Neither is a fairytale, but each is a decent sports narrative.